Come and see why tomorrow, Sunday 17th, is a BIG DAY for Forefront children and their friends. 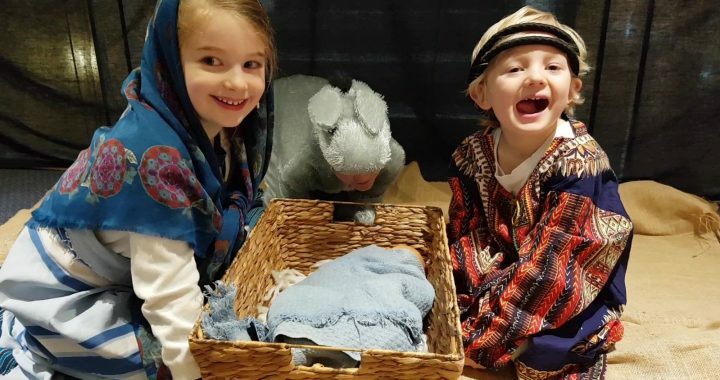 For the past few weeks they have been learning about the Christmas story and making a film about it! The public screening of this epic production, The Christmas Star, is at 10:30am in Chard Guildhall, and EVERYONE’S INVITED! Come and enjoy this modern take on the ancient story – and enjoy free carols and mince pies to help make the moment complete. 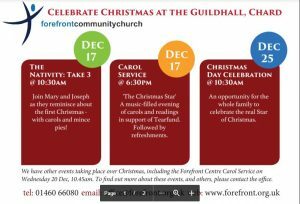 To get the full traditional Christmas experience, come back to the Guildhall at 6.30pm for our Carol Service, again themed “The Christmas Star”. It’s a music-filled evening of carols and readings with an opportunity to donate to work among homeless, refugee and war-affected populations through Tearfund. Followed by refreshments. The congregation will be meeting to offer up a “Present for Christmas” on Sunday 24th December, at 10:30am in the Guildhall. And on Christmas Day there’s a chance to put God first as we offer him thanks at 10.30am – an opportunity for the whole family to celebrate the real Star of Christmas.